My flamenco model is rooted in the traditional Spanish construction of the guitars I’ve played and studied by important flamenco guitar makers – Santos Hernandez, Faustino Conde’, Manuel de la Chica, Barbero, Gerundino Fernandez, et al. I don’t stray from the work and principles of these makers who I admire greatly. The plantillas I use for my flamenco guitars are copied from a 1927 Santos Hernandez or a 1971 Faustino Conde’ – The bracing I use depends on the players instincts, desired sound and pulsacion, but the bracing is based on Barbero, Santos and Conde’ schemes. The traditional wood for flamenco guitars is cypress, but I’m pleased to accommodate the customer with an alternate, for example rosewood, walnut, maple, etc. 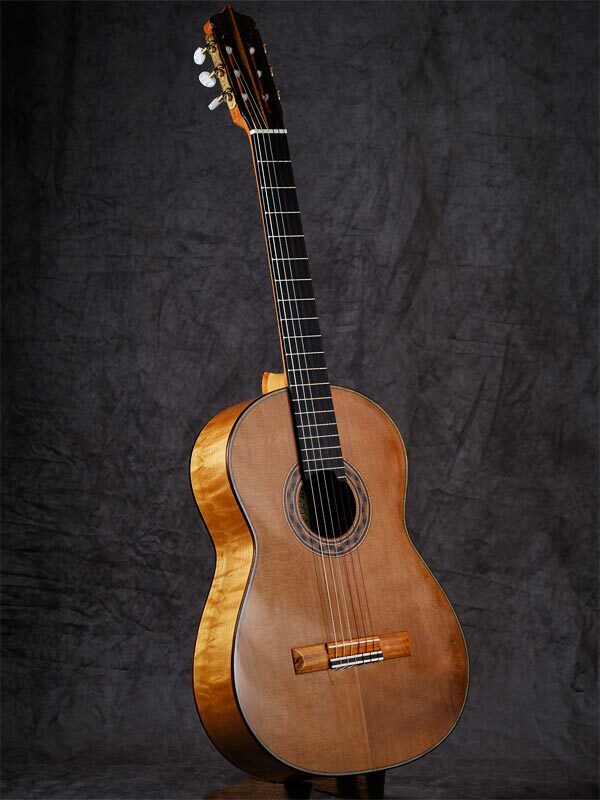 I like to make long scale, 655 mm to 665 mm, flamenco guitars, but I can certainly work for the player who wants a shorter scale by making the Alameda model as a flamenco guitar with a shorter scale. I’ve made some very nice shorter scale guitars, including the 645 mm scale flamenco that famed guitarist David Serva now plays. He says he really enjoys the comfort of the shorter scale. I love making flamenco guitars with very well fitted wooden pegs, but I also employ Pegheds mechanical pegs and of course standard roller tuners to the customers pleasure. Alameda Model – Classical and beyond. 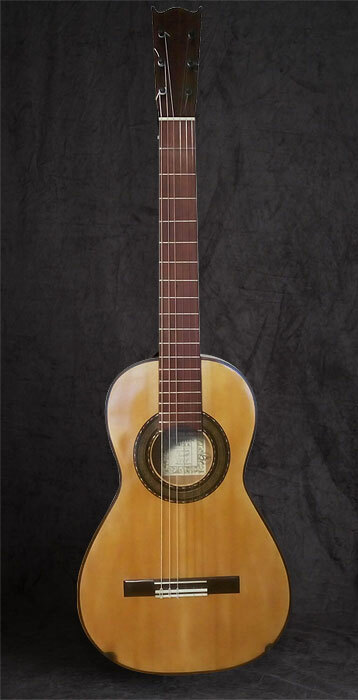 La Alameda is a fan braced guitar with a penetrating sound and rich depth of tone. 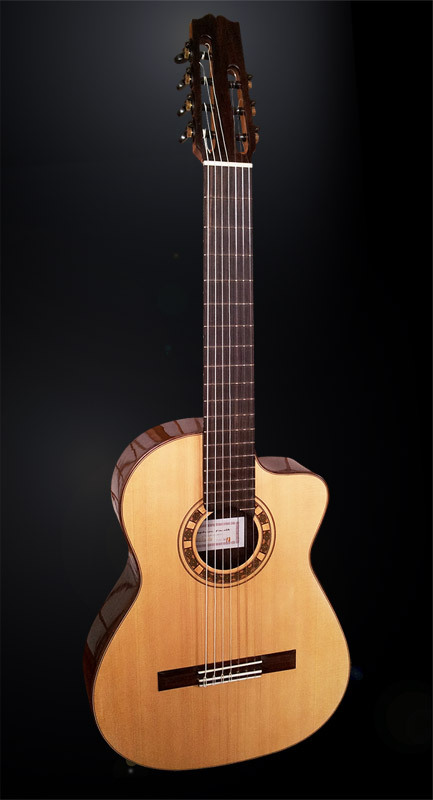 La Alameda is a full sized modern guitar, drawn with nuanced body proportions that make it a comfortable and intimate instrument, yet with excellent projection. It’s a good choice for guitarists who want to play a guitar that smartly handles scale lengths near 640 mm, but it works perfectly with standard 650 mm or longer scales. The neck width at the nut is standard at 50 mm, but can be custom ordered to the width of the players wishes. It can also be made with contemporary variations on fan bracing with great success according to the players preference for sound. This design works with both Spruce and Cedar tops. Due to careful attention to the design of the neck, bridge and top this model is responsive and easy to play, it’s been said by musicians to be adaptable to all kinds of guitar music. Japanese guitarist Fumikazu Itou called the Alameda model “Almighty” which used in Japanese means ‘universal’ in capability. It can also be built as a seven string version. Available in Maple, Rosewood, Cypress, or any guitar suitable wood the customer likes. I have built many seven string nylon string guitars; each player who commissioned a seven string had different ideas and needs. I try to pull together all the attributes each player asks for and more when I build a seven string. I want the seven string guitars to be versatile, yet be able to do the specific duty the player calls upon it to do. 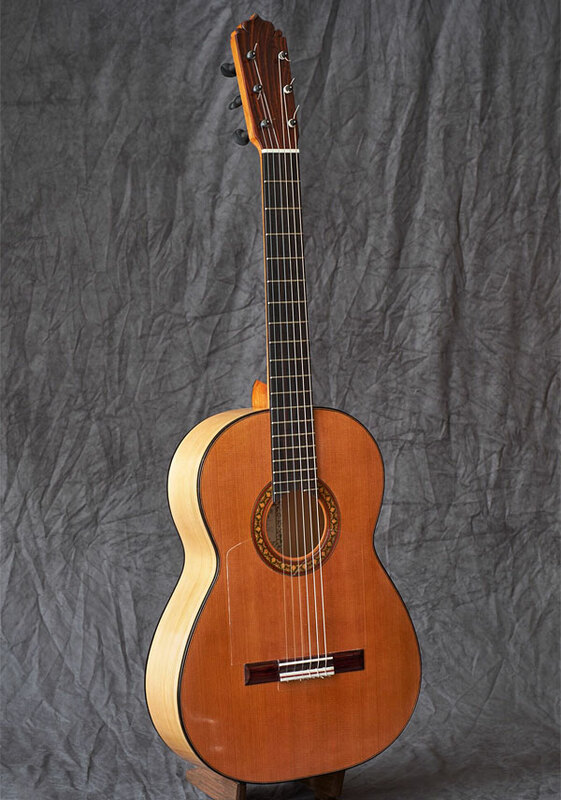 Some musicians have used the seven strings for Brazilian Choro music others to extend the bass range in playing flamenco, jazz or classical. My approach in working with a seven string customer is to ask them how they intend to use the guitar and how they want it to feel. Once I gain an understanding of what the player needs, I build the guitar heavier or lighter to bring out rounded classical sustain or a more metallic flamenco voice. Seven strings are a custom order and the price varies according to how the guitar is appointed with tuners, whether or not it has a cutaway body and trim work, etc. I require a 25% deposit for custom seven string orders because they are highly specialized and difficult to sell in a predominantly six string market. Every customer who has ordered a seven string has been exceptionally happy with the instrument and I look forward to working with musicians to build these guitars. An intimate body size that has a strong sonic presence characteristic of early fan braced guitars. Romantic and Classical era guitars are very popular today and have come into wide spread use among guitarists. 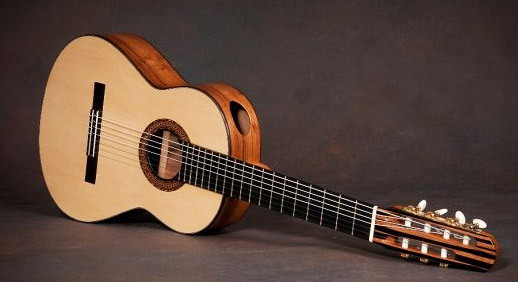 The CC model is based on the guitars made in Andalucia in the early to mid 19th century. This guitar is suited to play the early classical repertoire through romantic music, but it’s not limited to those time periods and can be used to play contemporary music. Highly suited to a player who simply wants an elegant guitar with a smaller body. In Sevilla during the late classical and early romantic period the guitar makers’ shops were located primarily on two streets, the Calle Carpenteria and the Calle Cerrageria. Antonio Torres would come to have his shop on the Calle Cerrageria, and nearby the fine cabinet makers and other guitar makers had shops on the Calle’ Carpinteria. I wanted to design a model that reflected the style of the pre- Torres guitars made throughout Andalucia from Cadiz to Almeria and chose the centrally located Sevilla street of guitar makers, the Calle Carpenteria, as a name for this model. It’s kind of special to me because I love the interesting shapes, wood choices and personalities of the guitars of this age, and I used to be a house building carpenter myself. I hope this model captures the mystery of art and music between the death of Goya and the start of the modern era of guitar making of Torres. I’m open to working closely with customers at creating special custom instruments based around this model in particular. This model comes as a 640 scale standard, but it’s highly adaptable to scales from 630 mm to 655 mm. This model works well in Rosewood, Cypress and Maple with either a Spruce or Cedar top, but it can be custom built with any wood a customer wishes. Available with wood pegs, Pegheds mechanical pegs, or tuners. Seven string versions available by custom order. I can also use Joe Robsons incomparable pine resin and linseed oil violin varnish with this model as it looks stunning on maple. Otherwise expect an expertly crafted French polish finish. Inquire for more details about any model. All my instruments are finished in French Polished shellac, unless otherwise noted by agreement with customer. I don’t spray lacquer do to my own health concerns with asthma, apologies, but I do hand rubbed oil / resin violin varnish finishes when appropriate for period instruments. © 2019 STEPHEN FAULK GUITARS. All Rights Reserved. Photography by Blane Ebersold.